Hello friends!!! Do you still remember me? This time I have not only been absent from blogging but also from all the social networking sites in general. It's not that I don't have anything to share. On the contrary, I have quite a few posts lined up in my drafts. This absence was quite unexpected actually. We had planned our annual vacation to Bangalore during the last week of November. But Purvi's Passport renewal got delayed and all of a sudden, we didn't know if we would be traveling. But somehow things got sorted out and Purvi's passport got renewed sooner than we expected. So we just decided to pack our bags and travel on the scheduled date. Instead of traveling straight to Bangalore, we decided to make brief stop over in Dubai to celebrate our wedding Anniversary. We managed to see all the important places in just two days. It was a little tiring but it was also a whole lot of fun. I just couldn't get enough of clicking the Burj Khalifa, the fountain and the fishes in the aquarium. The only thing that was better than all the shopping and the sights were the wishes that we got from family and friends on FB. Your wishes and blessing came as an icing on the cake. A big thank you for all of you for making my anniversary extra special. After I landed in Bangalore, I got swept away with all the shopping, visiting and pampering. So you see, updating the blog, invariably took a back seat. I know it's more than a week since my wedding anniversary, But it's never too late for an ice cream treat is it? 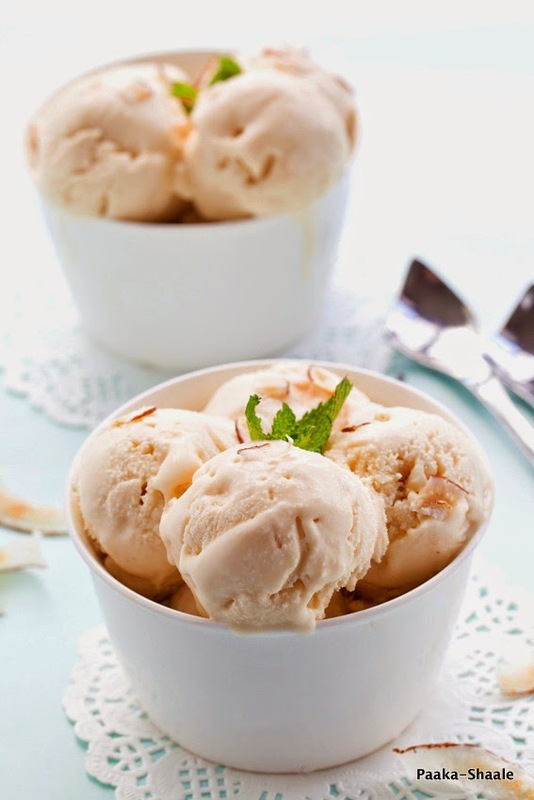 So I would like to treat you all with this coconut caramel ice cream for my anniversary. 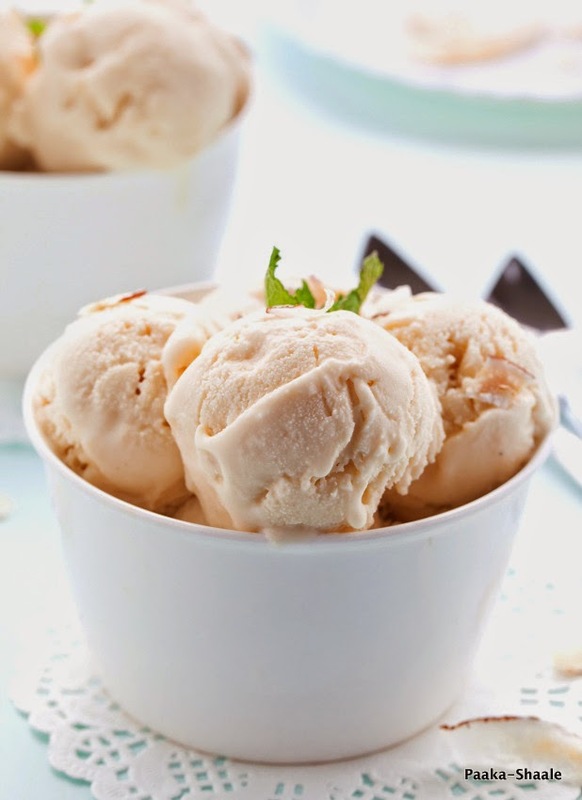 This magical, delicious and soft ice cream recipe came about when I decided to experiment with some left over caramel sauce and a tin of coconut cream. This experiment was a huge success and ice cream turned out to be extremely rich and delicious. The self proclaimed connoisseur of good food said it tasted like condensed milk with a tropical twist. And he couldn't stop eating it. To me, that is nothing short of a rave review. 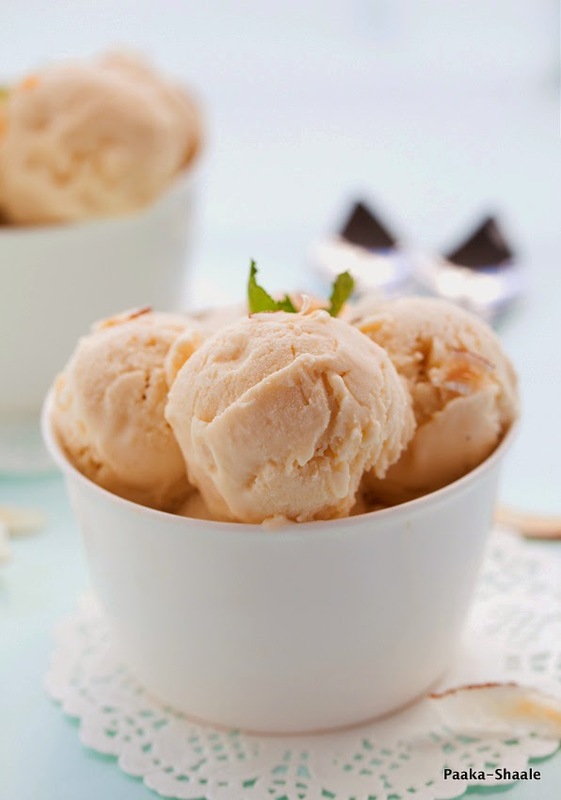 So if you are looking for new ice cream flavour, then I suggest, you give this recipe a try. I assure you, you will not be disappointed. Combine the Condensed milk, butter, Sugar and golden syrup in a thick bottomed pan and mix well. Allow the mixture to simmer over medium heat till the butter melts and the sugar is dissolved. Increase the heat and allow the mixture to bring to a boil. Allow the mixture to bubble for 3-4 minutes, stirring continuously so that it does not burn. Remove the mixture and set aside. Make a slurry by mixing the corn starch and milk and set aside. 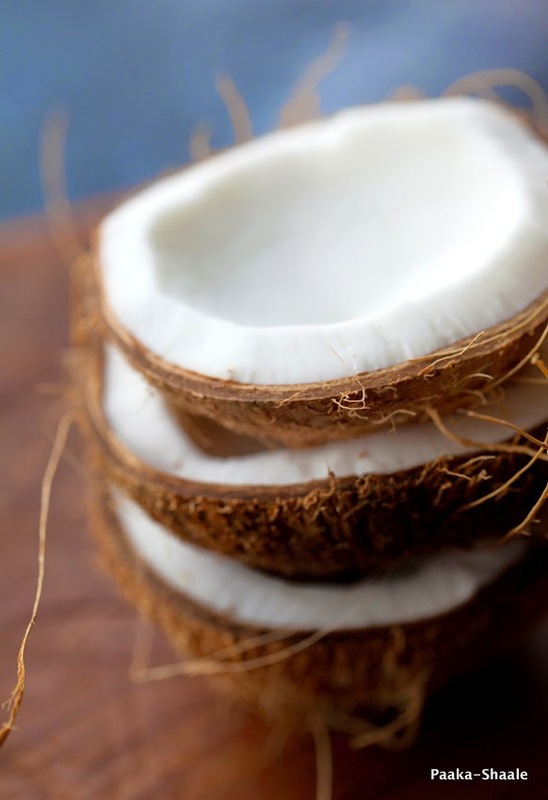 Combine the coconut cream and cream in a thick bottomed pan and allow the mixture to simmer over medium heat. Once the mixture comes to a gentle boil, stir in the slurry and the caramel and mix well. Allow the mixture to simmer for 10-15minutes more or until the mixture is thick enough to cover the back of the spoon. Transfer the mixture to a freezer safe bowl and set aside to cool completely. Cover the ice cream with a cling film touching the top and then secure it with an air tight lid. 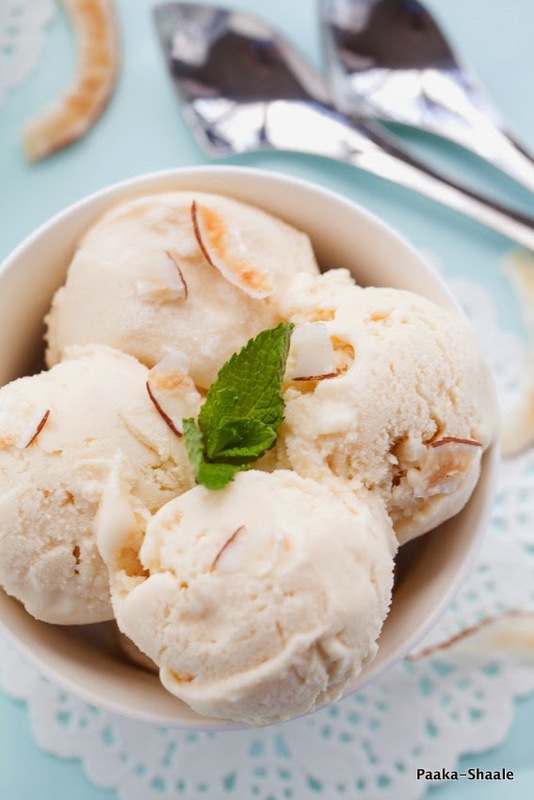 Freeze the ice cream for 4hrs or overnight and Enjoy!!! Wow! 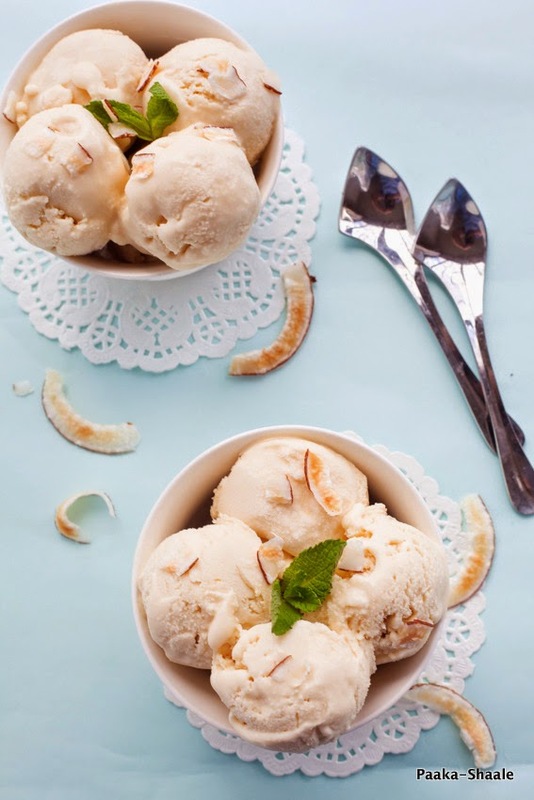 Coconut and caramel flavored ice cream looks like the ultimate treat visually and in every sense! bful clicks n yummy icecream..
one of the finest treats of life. looks so yumm. Loved the color and the texture. Belated anniversary wishes. Wow delicious ice cream. I love it. Coconut flavor is one of my best. Thank u for the recipe.